OLED is short for Organic Light Emitting Diode, a device composed of thin carbon-based films placed between two electrodes that emit light with the application of electricity. OLED displays are emissive devices - they emit light rather than manipulate transmitted external light like LCD displays. OLEDs feature a great contrast, response rate and are efficient, light and thin. Some OLED keyboards use a small OLED (usually PMOLED) display in each key. The display can change according to the application context. So for example when you switch languages, the keys can change. Or when you are running a specific application, the function keys can show their custom action. Apple's MacBook Pro range of high-end laptops started adopting an OLED Touch Bar instead of the traditional function keys in 2016. The display itself is either a 13" or a 15" LCD. The OLED strip is supported by most of Apple's applications and can show commonly used emojis in messaging applications, bookmarks while you browse and other context-activated options. It also includes a Touch ID sensor that is activated for example when you wish to pay online (on supported web stores). 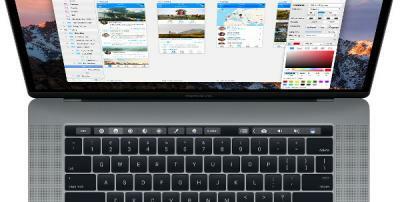 Apple released an API to developers can support the Touch Bar in third-party applications. Art.Lebedev is a design studio which pioneered OLED keyboards. 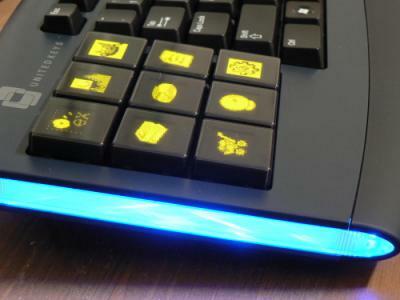 Their first keyboard was the 2007 Optimus OLED keyboard, which featured a full 113 OLED pad - each key has an embedded PMOLED display (48x48 pixels, 65K Colors). The Optimus was sold for over 1,500$ but is not produced anymore. 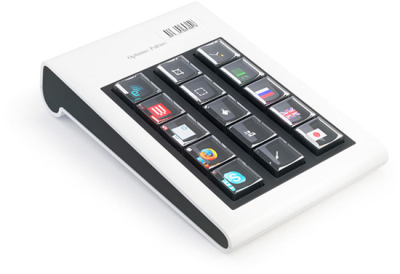 Other keyboards offered by Art.Lebedev were the Optimus Mini Three, a 3-keyed OLED keypad (these keys have a 96x96, 262K colors OLEDs) and the Optimus Aux - a 15-keys keypad with the same OLED displays as used in the Optimus Keyboard, with a hefty 650$ price tag. Art.Lebedev also designed a keyboard with a large touch OLED panel, called the Optimus Tactus, but this one was never actually released. In 2008, UnitedKeys launched an OLED keyboard that offered 103 'regular' keys plus a 9-OLED-keys pad (that can also be bought separately). The keyboard was priced at 179$ (the keypad's price was the same), or 89.99$ under the OCZ Sabre brand. We have posted a hands-on review back in December 2008. The keyboards are no longer shipping. 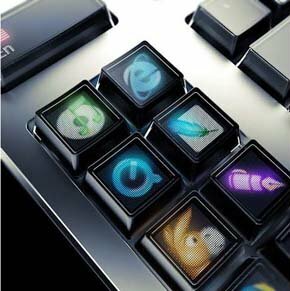 Another keyboard that is worth a mention is the Razer Tarantula, aimed for gamers. This is a more simple design - a normal keyboard, but with one high-resolution OLED 256x64 display.